How to get into a "self directed"
Extensive and difficult group of techniques that are performed in the struggle in the rack, are deflection shots. In fulfilling their attackers falling, caving in the back and throwing the opponent through itself. For the final part of this technique characteristic the turn the chest to the Mat the attacker. - the enemy or the Scarecrow. Call your opponent at the reception. For this, give him the opportunity to make you a throw a deflection. At the moment when uke is trying to get a grip, get ahead of it, and then do the same shot, perhaps with the same grip. Choose the most convenient option for you to capture. It can be performed in hand, for one of the hands, the torso, arm and torso, neck and torso, arm and neck. Take the capture, approaching the enemy, and bend slightly at the knees. Get the enemy off balance. Follow the lead from the carpet target. If you are divorced from the carpet of the enemy and fall at the same time, make a jerk hands up-backward, tilt the head back, straighten your legs and bend at the same time. The total force in this case upwards. If you need the isolation from the carpet being attacked before the fall starts, do the first detachment of the enemy, and then, slightly bending feet, drop, then execute the pull, hit, throw himself through the enemy. This option is justified if your opponent less growth. Follow the turn the chest to the carpet with the use of a bridge or without. Turn depends on height of capture and its density, the strength podbela, behavior during the throw of the enemy. The higher you took the capture, lower density, less power than podbela, the lower perform the turning at equal other conditions. To make the reversal more profitable without touching the carpet head. In this case, less time is spent on the execution of reception and increases the force of the fall on the carpet target. 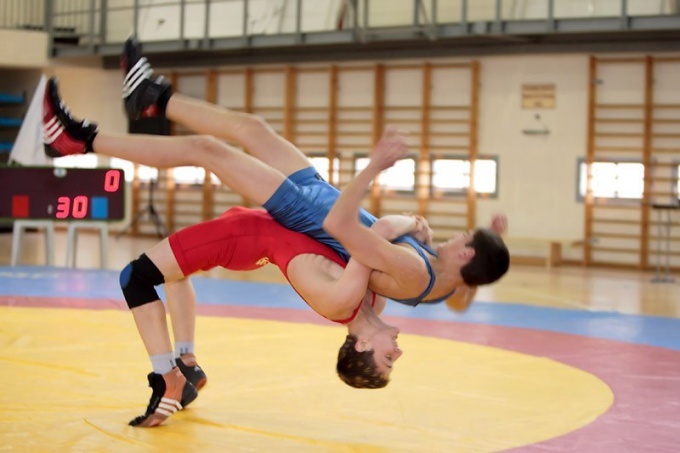 Reversal depending on the conditions of the fight can be made based on the leg side which is a reversal, or relying on the leg opposite the side of the turn. Follow the retention and boosting the enemy. Before learning the throws of depression, learn to perform a variety of exercises to strengthen the bridge, improve the strength of the extensors of the legs and back muscles. Eliminate the fear of getting injuries when you fall, learning becomes confident on the bridge. In combinations bright a deflection is a big place. These items are well associated with the churning, shooting tilt and Welt turned a takedown.